An earthshaking tale in pictures and script! I will put a “Spoiler Alert” here. What I share will not give away the true adventure in the book, but there are those who will thank me for the spoiler alert. Read on at your own peril! In one of the original Tarzan stories by his creator Edgar Rice Burroughs, it is mentioned that Tarzan saved the life of a witch doctor. In gratitude, the witch doctor put Tarzan through a process that would make him forever young. In another story, Tarzan and Jane are treated with a certain drug along with a native couple, which will do basically the same thing. In this graphic novel, Tarzan and Jane are incognito, because they are both over 100 years old. To alleviate suspicion, they have changed names several times and are considered to be dead. However, in the African jungle, the witch doctor that treated Tarzan has begun to age after at least two centuries of life. He needs more of the herb he used for the ceremony, but it is in a place where he can no longer go. Thus he needs Tarzan to open the way. Then there is the illegal ivory trade. The ban on the trade hasn’t kept poachers from gunning elephants down and cutting out the tusks with chainsaws. Tarzan can smell the difference between new ivory—now banned in most of the world—and older ivory, taken while the trade was still legal. He can even tell which elephant has lost its life because many of them were his friends. With Tarzan smashing the ivory trade wherever he can, one of the ringleaders hires a man to kill Tarzan and wipe out the Waziri tribe, Tarzan’s friends. The witch doctor meanwhile has cast a spell on Tarzan that will make him flee back to Africa, thus unknowingly sending him straight into the hit man’s path. 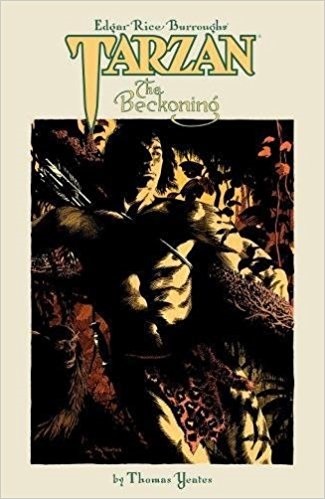 Adventure in the jungle, in lost civilizations, bloody fighting, and deep mystery all lie in the pages of this graphic novel. Jane traces Tarzan to the jungle, where she ends up with her own adventure. The final showdown brings Tarzan and Jane back together; enemies vanquished. This is a Tarzan adventure I think Edgar Rice Burroughs would approve of. I give this amazing story five stars.